Now that the Sebring MGA is finished I decided that I needed a change of pace. So rather than beginning work on one of the Twin Cam MGAs (which is what I should have done) I chose instead to acquire this Salmon bodied VA Tickford, chassis VA 1616S pictured below. 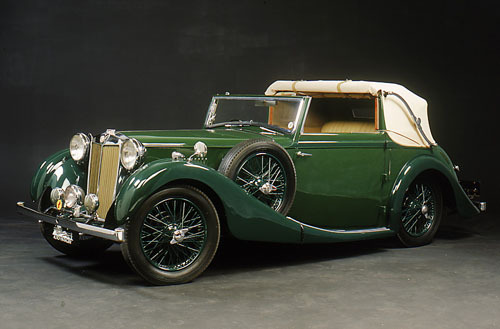 These are incredibly elegant four seater touring cars with a two position drophead top, side mount spare, roll up glass door windows plus a glass window in the folding top. Not to mention amenities such as a built in hydraulic jacking system at all four wheels, adjustable shock absorbers controlled by a knob on the dash, and an oil level gauge operated by a float mechanism in the sump. 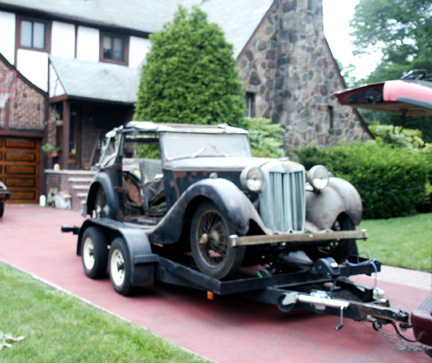 The wood that forms the coachbuilt body is totally shot so this is going to be a major project to resurrect but if you have looked at the before photos of the Sebring MGA you already know that I love a challenge. Above is VA 1616S as it sat for 27 years in storage on the campus of Princeton and as it arrived at my home. 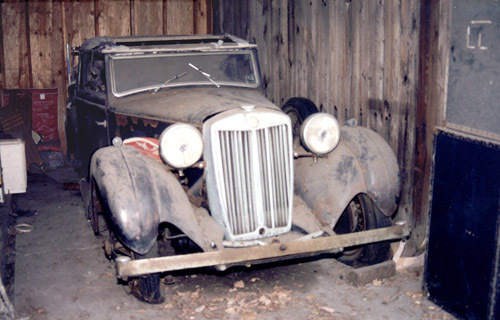 It appears to have spent part of its life in Tripoli, Libya based on the license plate (below) which was still on the car. It came to New York sometime in the '50s and was a running vehicle until the very early '60s at the latest. It may be difficult to appreciated from the above photos what a VA Tickford is supposed to look like, so here is Jim Alcorn's magnificently restored example in duo tone green. It is going to be a long while and a ton of money before VA 1616S looks anything at all like this! 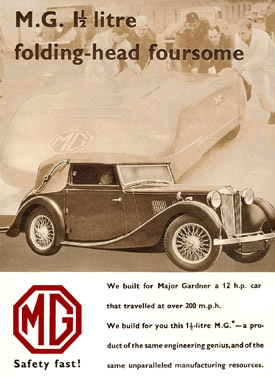 If you would like more information about MG VA Saloons and Tickfords visit Bas de Voot's Haunted Saloon website at this link.